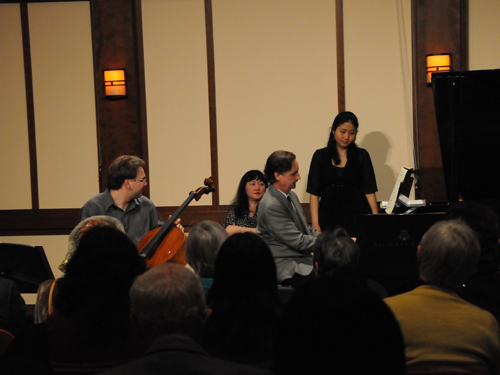 On the day prior to the duo’s performance of the Beethoven sonata cycle in Alice Tully Hall, the Chamber Music Society of Lincoln Center presented a first-time double master class in the Rose Studio, in which five cello-piano duos played the sonatas in chronological order for David and Wu Han. 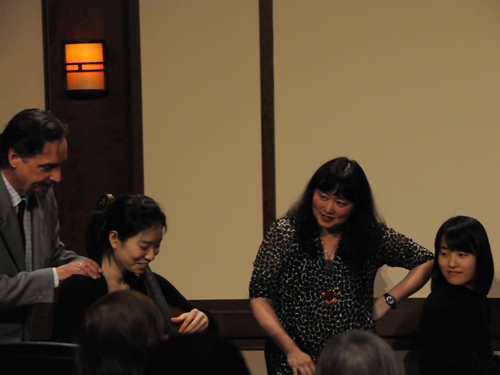 This was the first master class given by the Society’s artistic directors in the annual series, which presents Society artists and guest artists as master teachers in public classes. Virtually at the same moment we committed to performing the Beethoven sonatas for CMS, we also suggested the idea of a double master class to the Society’s education department. We had previously taught the five sonatas in three classes at the Aspen Festival, during the summer in which we recorded them in Harris Concert Hall, and it was a thrilling and memorable experience for us, one that we had dreamed of repeating. 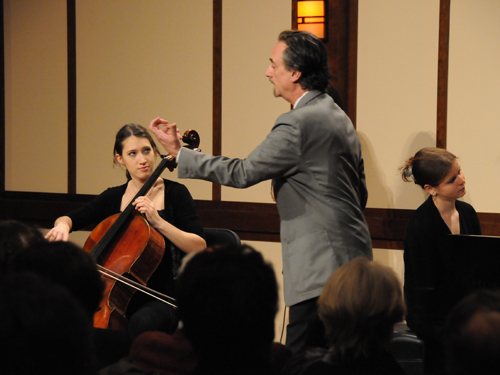 This opportunity – amidst the Beethoven season at CMS during which all the quartets would be performed, plus all the violin and cello sonatas – seemed highly appropriate, and sure enough, the reservations for seats in the room soon filled to capacity. We heard five well-prepared, eager and cooperative duos over the space of almost five hours. We always admire, from the outset, the courage these young people have to possess to submit themselves to God-knowS-what in front of an audience. But it is a chance for young musicians, in the hands of considerate and well-meaning teachers, to benefit from the experience musicians like us have had studying, practicing and performing works like the Beethoven sonatas over many years. 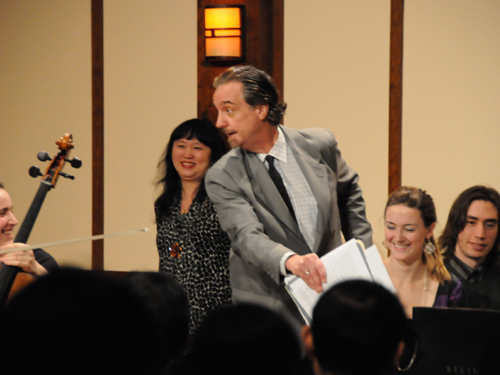 In addition, it is an opportunity to share stories and experiences with students and audience that can make a difference forever in one’s perspectives on music and on performing (see “Master Class Master Class” in the blog for a more in-depth analysis of the master class teaching format). Very interestingly, each sonata presented different challenges for the performers that we did our best to analyze and offer solutions for. The opportunity Beethoven offers for drama, especially in the improvisatory introduction in the first sonata, requires physical as well as musical discipline in order to hold the audience’s attention, especially during silences. We worked with the duo to help them create a sense that they were actually improvising, that ideas were occurring to them in the moment, something that’s very hard to do when, as a well-prepared performer, you already know what’s coming. We spoke a lot about the setting in which the two early sonatas were premiered, what the audience probably expected, and the impression we believe Beethoven was trying to make. The second sonata, in g minor, is much more challenging than the first in every way, and once again, we discussed the increased possibilities for dramatic impact. Wu Han worked with the pianist on the legato of the introduction’s mysterious, descending dotted-rhythm scales, while I was concerned with the cellist’s ability to sustain the long lines. 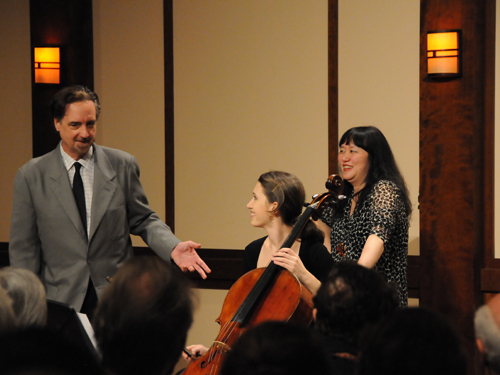 The second stormy movement presents challenges for balance, the cello easily lost amidst the piano’s many triplets. And the finale, often played in four rather than in two as Beethoven intended, received an infusion of about ten additional points on the metronome, and these gifted young players really brought the movement to life in a display of technical fireworks. The final sonata of the morning session was the great A major sonata, Op. 69, and we spent some time speaking about how Beethoven’s style had changed. Wu Han read from her famous list of Beethoven works from this period, a list that she carries inside her own music to the sonatas. Rhythmic accuracy in the Scherzo is tricky, as the entire movement is phrased across the bar line, and in a very quick tempo. The technical difficulty for the cello increases drastically here, and the responsibility is now much more equally balanced between the instruments. The A major sonata requires not only great instrumental finesse but also a depth of feeling and maturity not found in the previous sonatas. Sustaining lines, passing ideas back and forth, and completing each others’ melodies are instrumental and ensemble skills required in depth for this piece. After a lunch break we moved into Beethoven’s late style sonatas of 1815, and a completely changed musical world. The first of the two, in C major, is composed in the shape of and to a certain extent the style of a baroque trio sonata. The tranquil first part is composed in three lines, one for the cello with left and right hands of the piano carrying equally important contrapuntal lines. Finding the right color for the cello part, and pairing it sonically with either the piano’s upper or lower line, is a tricky task, since it’s hard to hear what’s really coming out when you’re playing on stage. We took the music apart so that the intricacies could be easily heard, which was very enlightening. The movement also presents challenges in terms of tempo and articulation, which have to handled with the greatest delicacy and discrimination. The ensuing Allegro, with its tightly compressed structure, dotted rhythms, lack of transitions and down-time, is the emotional polar opposite of the opening, and makes heavy demands on the performers’ and listeners’ concentrations. The next movement is a written-out improvisation for the two instruments, with moments of dreamlike bliss and terrifying darkness emerging spontaneously. The heavenly return of the first movement needed more magic, and we actually wound up asking our performers to play the preceding section less beautifully in order to hold something special in reserve. And the finale, also like a fast baroque movement (we compared it to a movement from Bach’s Brandenburg Concertos) demands a steady tempo, square rhythms, and perfect control to pull it off. The final sonata in D major is Beethoven’s culmination of the cello-piano genre. In it, especially in the daunting fugue which closes the cycle, he achieves full integration of the two instruments. The first movement, like the closing of the fourth sonata, needs even, baroque-style bow strokes in the running sixteenth notes, but the intervening material is much more schizophrenic than any baroque music. It’s as though Beethoven’s musical train of thought is constantly being interrupted, distracted, pulled in many directions. Totally inexplicable events take place, yet in the end, they all make sense in a way that only Beethoven’s music can. For the tragic slow movement, we loaned the performers our own mental picture of a funeral march, complete with heavy trodding, the sound of horses’ hoofs, and later, even goblins and ghosts. The middle section, which is in major, we believe was meant to recall better times, and contains probably the most profoundly beautiful music of the entire cycle. 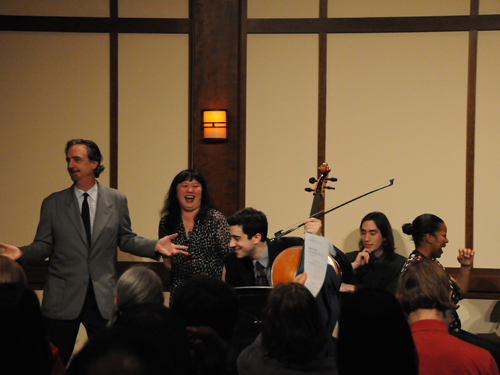 Our young performers took the final fugue at an astonishing clip. While they could really play all the notes, our audience voted for a slower tempo in which they could better digest all the information, and we closed the class with all marveling at Beethoven’s creation, composed in deafness, but with so much for us all to hear. Having really only scratched the surface of possibility with each sonata, we thanked our performers and the audience for being with us, and expressed again our gratitude to Beethoven, wherever he his, for having given us the gift of these sonatas to cherish forever. 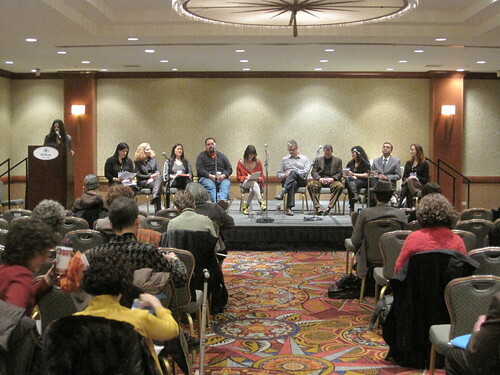 Several weeks ago, I had the opportunity to participate in a panel discussion as part of the 2010 APAP Conference, an annual convention hosted in New York City by the Association of Performing Arts Presenters. 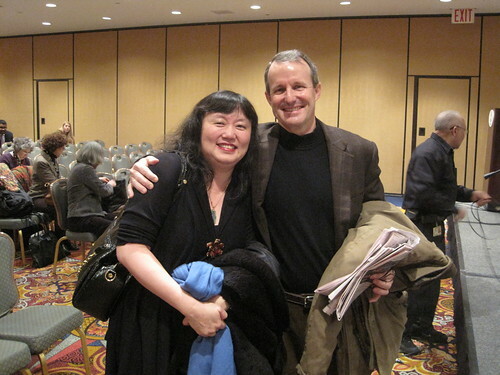 The APAP Conference is a major forum for networking and exchanging ideas with colleagues across the performing arts. Friday’s discussion focused on strategies for expanding and engaging audiences; the panel included a number of distinguished colleagues from classical, jazz, and contemporary music, including Elena Park from the Metropolitan Opera; Sunil Iyengar, Research & Analysis Director of the National Endowment for the Arts; composer Julia Wolfe, one of the founding directors of Bang on a Can; jazz drummer Matt Wilson; and—a special treat for me—my old friend Rob Gibson, Executive & Artistic Director of the Savannah Music Festival; among others. Such a diverse group of panelists made for an array of interesting perspectives on the issues at hand. Topics included use of new technology to enhance audience experience and the importance of arts education. On one level, the discussion, like many discussions about the contemporary arts climate, was frustrating. What becomes immediately clear in such conversations is the many difficulties facing the arts: funding challenges, competition with mainstream popular culture, misperceptions of classical music and other “marginalized” art forms among the wider public—these familiar refrains among arts presenters have become like tired clichés. At the end of the day, there may be no ready solutions; it’s easy to come away disheartened. But the conclusion I choose to arrive at from Friday’s panel is a hopeful one. What I saw on Friday was a community of arts advocates who, despite differences of opinion on details, care deeply about what they do. Yes, we face many challenges, and there is a lot of work to be done. The conversation can become further bewildering when considering, as we had on Friday, numerous presenters who are primed to serve different audiences, and therefore fulfill different needs. But the passionate commitment to the arts that I am privileged to witness everyday tells me that today’s artists, advocates, and cultural leaders are up to the challenge. The idea that you should forget about your weak points and concentrate on your strong points goes against everything I’ve ever learned about playing music. On the day of release of David and Wu Han’s new recording of four contemporary cello-piano duos, ArtistLed received an email from a listener asking for comment about the repertoire on the new album. This listener explained, “Over the years I have tried to listen to many modern compositions, and find that most of them are unlistenable.” The following is a response provided by ArtistLed Artistic Administrator Patrick Castillo. Thank you for your email and interest in ArtistLed’s new release. I am sorry to hear that your experience with contemporary music heretofore has left a sour impression. I appreciate your active effort as a listener to learn more about new music—by the time you’ve spent listening to modern music, and by the thoughtfulness of your inquiry about our new release. As I’m sure you know, with many listeners, contemporary music is often not given that chance. First, I would propose that, while any listener with an open mind and open ears will inevitably encounter works that he or she personally finds “unlistenable,” I hope you will agree that it is ultimately unfair to equate their unlistenability with the era in which they were composed. To conclude by the same rationale that the music of the Classical period is invariably uplifting and sublime would be to overlook the, frankly, pedestrian works of Ignatz von Beecke, Josef Myslivecek, and other lesser contemporaries of Mozart. History has crowned Mozart the supreme composer of his day and left most of his peers in relative obscurity, sparing us the task of evaluating their music. The conclusion that many listeners draw is that all of the music of that period was heavenly (and all of the music of our own period excruciatingly dissonant). The flaw in directly correlating artistic quality with historical context is especially salient to the music of our time, given the incredibly rich spectrum of music being composed today. Your saying that you find contemporary music “unlistenable” actually leaves me quite in the dark about specifically what music does not appeal to you: the atonal complexity of Babbitt and Carter, or the neo-Romanticism of John Corigliano? the Latin folk-infused music of Osvaldo Golijov? the minimalists Steve Reich and Philip Glass? That these composers (and innumerable others) are contemporaries is almost a fluke of history; so profoundly different are their modes of expression. And still, the music of Bruce Adolphe, Lera Auerbach, Pierre Jalbert, and George Tsontakis cannot be equated with any of them. We are fortunate to have inherited Mozart as the chief ambassador of the Classical period. The music of our time relies on today’s artists and listeners for its fair shake. ArtistLed’s new disc represents our latest contribution to this process. You’ve asked me to comment on the repertoire on our new release: the only fair comment I can make is to say that the disc features four living composers personally selected by David and Wu Han for this project on the basis of their (David and Wu Han’s) intense personal response to their music. Such a deep, emotional response can only occur if the music is allowed to speak for itself, without preconceptions (whether those preconceptions result from one’s general feelings about contemporary music or from whatever adjectives I might choose to describe these new pieces). In conjunction with this new release, we have designed a microsite devoted to the four new works: www.fordavidandwuhan.com. This site includes video conversations with David, Wu Han, each of the four composers on the disc, and others, as well as a small taste of the music. I invite you to visit and explore this website, and hope it provides an approachable point of entry to learn more about the music on this disc. We have also produced an AudioNotes segment on the Auerbach Sonata, which features further commentary from the composer with more extensive musical examples; you can download this AudioNotes feature for free by visiting www.davidfinckelandwuhan.com and typing AuerbachAN into the download code box in the bottom right of the page. We cannot promise that you will be as seduced by these four new works as we are. We can only assure you that our new release is exclusively the result of David and Wu Han’s fervent artistic commitment to them. My apologies for this lengthy reply. I felt that the candor of your inquiry deserved an equally thoughtful response. Thank you again for your email; please feel free to contact me if I may be of any further assistance. Finally – bow changes. They are not such a mystery after all. Beginning a long, sustained melody requires a good start with the bow. Here’s how to do it. Beginning any bow stroke with proper momentum is the way to ensure a good sound from the start.